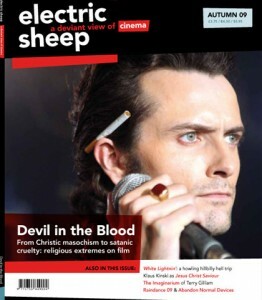 ‘Ther’s tha devil movin’ in my blood’ – The autumn 09 issue of Electric Sheep looks at religious extremes on film from Christic masochism to satanic cruelty. The extraordinary White Lightnin’ explores the Old Testament world of demented mountain dancer Jesco White while Klaus Kinski disastrously reinterprets the New Testament in Jesus Christ Saviour, and subversives Alejandro Jodorowsky and Kenneth Anger dynamite divine myths. ……….you may like to know,wallflower press are ripping your readers off with a Â£2.50 delivery charge,just for one copy of your magazine !!!!!!!!!!!!!!!!!!!!!!!!!!!!!!!!!!!!!!!!!!!!!!!!!!!!!!!!!!!!!!! !